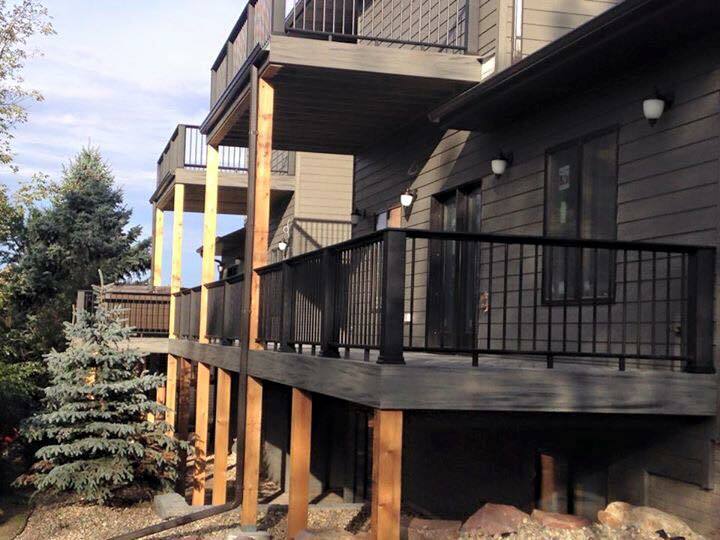 Deck Construction | Integrity Construction, Inc. Expanding living space into the outdoors is a popular choice for many homeowners. We can help you extend your view with a new deck, screened porch or three-season room. We are the builder of choice for Sioux Falls area homeowners and commercial clients for both wood and composite deck construction. TREX – This maintenance-free decking is the first composite material to meet Integrity’s high standards. With a wide variety of colors and styles, TREX is a great choice for a maintenance-free deck. Wood Decks – Still popular and cost-effective, wood provides natural beauty and an affordable choice for homeowners. Cedar decking is a good option for its longevity and natural resistance to rot, decay and insects. Our expertise reaches beyond decks and includes screened porches and three-season rooms. In the upper Midwest, these options allow you to enjoy your outdoor living room not only in the summer, but also throughout the year. Not all building materials are built the same. These companies have proven their integrity.